If physically active people consume one and a half grams of a mixture of the amino acids phenylalanine, alanine and arginine on a daily basis, the amount of fat in their abdominal cavity significantly decreases. Researchers from the Japanese Meiji Corporation reported this in Diabetes, Metabolic Syndrome and Obesity: Targets and Therapy. The Japanese divided 194 slightly obese people aged 20-64 years, with a BMI between 25 and 30, into 2 groups. For 12 weeks, one group received 1500 milligrams of the amino acids phenylalanine, alanine and arginine (42:38:20) [A-mix] every day. Another group received a placebo. Meii's R&D-department, together with researchers from the University of Tsubuka, has been studying the effect of amino acid supplementation on fat oxidation for several years. VAAM, an abbreviation of Vespa Amino Acid Mixture, was a result of that research. 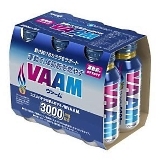 According to Meiji studies, supplementation with three grams of VAAM per day would improve the results of weight loss attempts, and increase the endurance of athletes. Both groups, thanks to a little encouragement from the researchers, walked about 10,000 steps a day. Both groups lost body weight and body fat, but that did not lead to a statistically significant decrease in weight or fat mass in any of the groups. Both groups lost visceral fat, and this decrease was significantly greater among the amino acid cocktail users. "The combination of A-mix supplementation and physical activity promotion facilitated abdominal fat reduction in overweight adults", the researchers summarize. Diabetes Metab Syndr Obes. 2018 Feb 26;11:23-33. If these researchers have got the right end of the stick, then L-citrulline may help people with an apple-shaped body to acquire a pear-shaped body. GABA promotes sleep and is a growth hormone enhancer, but GABA supplements can also help obese people to stay healthy. This is because GABA makes your cells more sensitive to insulin. If you are heading towards old age, a daily dose of the alpha amino acid L-citrulline may help reduce the amount of fat and increase the amount of muscle you have. Animal study.